I've discovered there are photos I can take with my cell phone that I can't take with a regular camera. I'm quite mindful of how some places don't like photographs being taken. But, when you pretend to be answering a text on your cell phone, you can easily take a photo and email it to yourself and they aren't too much the wiser. I've wanted to blog about this for some time, but my self-consciousness about photographing it overruled the collecting of the illustrative photo. But, lacking a camera right now, the cell phones camera is remarkably decent at capturing those photos I use for blog illustrations. I have been puzzling about this for months. It's a potato. It's in plastic. It costs 3 times what the potatoes lying loose above it cost. The label on the potatoes says, "Perfect for the microwave. Just prick and cook for 45 minutes." And what do you want to bet someone buys one of these and just puts it in the microwave without poking it? 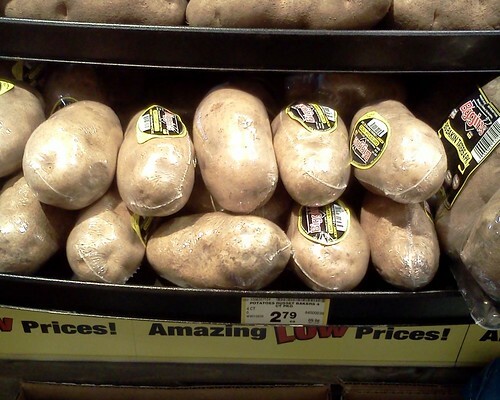 I guess there is a market for plastic shrink-wrapped potatoes. I guess this makes it easy to have a baker when you want it. I guess I come from a mind-set that taught me how to cook. Bah. You don't shrink-wrap potatoes no matter the convenience. Now, if you will excuse me, I have cottage fries to make. Don't you dare shrink-wrap those.